Thelma & Louise is about two women who go on the lam when they end up accidentally killing someone while on their way to a weekend getaway. I've always seen this movie pop up in list, and know how it ends but I haven't watched it until recently. This is a fantastic dramatic adventure film with amazing performances by the two leads. Thelma and Louise led ordinary lives; Thelma is a housewife for an infantile and demanding husband, while Louise works as a waitress for a local diner. From the first time the characters are presented, there are already distinct personalities peppered between the two characters: Thelma was meek, and Louise was self-confident. It's important for the narrative that their initial personalities be established to give character development ample time to manifest on the duration of the film. That development wasn't subtle: the audience witnesses it when Thelma meets her assailant, or how they handled their situation and every occasion afterwards. As the film progressed, they both develop as people, with the script even providing vulnerable points for the two characters, Louise in particular. 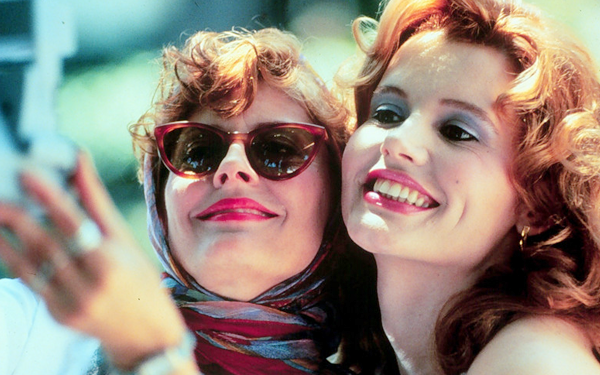 Susan Sarandon and Geena Davis' performances complimented each other. Granted, the two had different personalities, but the friendship vibrates onscreen. I would love to see them pair again as their dynamic seemed to work. Another prominent character in the narrative is Hal, played by Harvey Keitel. Hal is the cop in charge of the murder case, and has been pursuing the two women for question. I think Hal is supposed to be a compelling character, and while Keitel gives a good performance, there was something missing that makes his character worth remembering. Even in his last scene, it still lacked that factor that would elevate his character. I mentioned how I knew how things were going to end, but like most popular movies, this is one ending that one doesn't want to be spoiled for. That final shot gave me goosebumps; it was a terrific way to end the film. There were some things that could be predictable, but it was a wonderful movie overall. Oh I have no idea how it ends... Really want to see it because it is that movie you always see mentioned from time to time! It deserves those mentions; it's a good film and it still holds up today. I will be doing this movie in 2019!